You Know What Fall Time Means! There are so many signs that it’s fall time again from the changing color of the leaves to seeing big yellow school busses carrying dozens of children. However, the biggest sign that we have all come to associate with the fall season is PUMPKIN! Pumpkin spice lattes, pumpkin bread, pumpkin smelling candles, and most important – Gluten Free Pumpkin Cookies! Yes, maybe some think the pumpkin association is over the top, but who are we to shy away and not add our little touch of fall to the KetoConnect recipes blog?! So, we’ve made for you the PERFECT cookie. The perfect PUMPKIN SPICE cookie. We’ve tried so many variations on keto cookies, but each time we try, something seems to be off. It’s either too crumbly, too chewy or the flavors aren’t properly balanced. So going into this, we knew the physical sensations produced by the cookie, aka the mouth feel, would be the most important aspect (as is with any cookie!) What we want in this cookie is moistness, a little chew, with a little bite and a perfectly balanced flavor profile! Pumpkin pie spice is definitely a strong spice – a little goes a long way, but, we didn’t just want the pumpkin spice flavor. 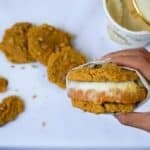 We wanted the cookie to also be appealing to the eye with a strong orange color and a real kick of pumpkin flavor, so we also used pumpkin puree. The puree created a moistness I had yet to taste in any cookie I’ve eaten. The cookie gave a good bite with some chew and then it just melted in my mouth… do you taste what I taste?! Now, that’s some great mouth feel. Fun Fact: Matthew loves using the phrase mouth feel. When we first met, I think he made it a goal to use it as many times as possible in front of me. And, whatever his intention was it worked because we fell in love. We won’t lie to you, we were nervous about the outcome of the cookie. We had never used pumpkin puree in this way, but we knew we had to just go for it! As Matthew would say, “Success is 99% failure,” So we added an arbitrary amount of puree and put them in the oven to bake, repeatedly checking on them to see what they were doing! It was evident we were in business when the cookies started to brown. We pulled them out and let them cool before trying them, and let me tell you, those extra 20 minutes we let them cool was necessary. Matthew had even come up with a brilliant idea to use them for an ice cream sandwich! He made a circle mold of halo top vanilla bean and the pumpkin puree, and froze it. But, sandwich aside, the cookies were PERFECT! So moist and rich with pumpkin. I couldn’t have been more proud of our first fall recipe! By the way, the ice cream sandwich was a dream come true… take a look! So, what are you waiting for!? It’s already October. Don’t be the last one to the party. We’ve got the recipe for you below and the pictures to give you proof these won’t disappoint. Maybe get a little wild and add chocolate chips… these Gluten Free Pumpkin Cookies are your oyster! Using a hand mixer combine the cold butter, half egg, and vanilla extract. Combine all dry ingredients and add to the butter mixture. Combine well using hand mixer. Fold in walnuts. Save some for topping the cookies! Line baking sheets with cookies to whatever size you want and flatten them out a little bit. Bake at 325 for 15-18 minutes. Let cool for about 20 minutes. Enjoy!